Excerpt from The History of Danish Animated Cartoons. Professionally speaking, there was enough to do on the job. I was also recently in writing been appointed as animated cartoon director by the directors and executives of Nordic Animated Cartoon Films. This was due to several things, including my independent work in several advertising cartoons, the short film “He, She and Money” (1963; “Han, hun og pengene”) and especially the advertising cartoon series of the Finnish coffee company TUKO, which in the years 1964-70 was made a total of 29 short cartoons, and of these I stood even for around twenty films. The remaining 9 Tuko film took Steinaa and Lehmann care of in common, because I did not have time to make these movies. This summer, more precisely in early June, we were at the Nordic Cartoons getting visit by one of Disney's grand old men, animator and animation director Ward Kimball and his sweet wife Betty. That year Kimball was member of the jury at the Cartoon Film Festival in Annecy, and here he met my colleague, the animated cartoons enthusiast Walter Lehmann, who asked Kimball and his wife if they on their return trip to California would come to Copenhagen and including also visit Nordic Animated Cartoon Films. This visit is also described in detail in section DANISH CARTOONS 1950 - 1970 Part 2, but must be supplemented with the following personal observations and experiences from the several-hour longvisit, which I have been remembering ever since. Immediately upon arrival at Nordisk Film’s domain at Mosedalvej was Kimball and his wife's arrival reported by telephone by the janitress, then Kirsten Steinaa ran down the stairs to greet the couple welcome and accompany them up the stairs to the headquarters of the Nordic Animated Cartoon Films. Here they greeted Ib Steinaa, and after a brief chat about the weather Ib and Kirsten were guiding the celebrated guests around the study, to show the otherwise not very impressive sites, and to greet employees. As usual with this kind of visit the participants ended in 'my' studio, where they greeted me, which at the time was sitting alone here in the very small room. At that time there was not pinned any story drawings up on the board, but various other drawings, sketches and clippings. One of the clips was a full-page joke drawing from probably the monthly publication “Mandens Blad” ("The Man's Magazine"), which showed a happily smiling naked Dopey lying in bed next to a naked Snow White, and the six other dwarves stood around the bed and stared in amazement. The text read: "And HIM we have called DOPEY!" When I translated the text for Kimball, he laughed out loud. - At the time I knew that Kimball back in the years 1935-36 had been one of the animators on "Snow White and the Seven Dwarfs" (1937), and when I ventured to question him about it, he replied that he well enough had been an employee at the "Snow White" movie and animated two sequences: the sequence where the dwarfs build a bed for Snow White and the sequence where they eat soup. But, he added, none of the scenes were beyond the state of cleaning up, because Disney had found out that the two sequences "would slow down the pace of the film". The two line test sequences has since become world famous through the TV and various VHS and DVD releases. In this photo from June 29, 1965, recorded in the courtyard at Nordisk Film in Valby, Ward Kimball is seen sitting behind the wheel of the veteran car, and beside him Walther Lehmann. Rear passengers are from left Flemming Jensen, Kirsten Steinaa and Betty Kimball. 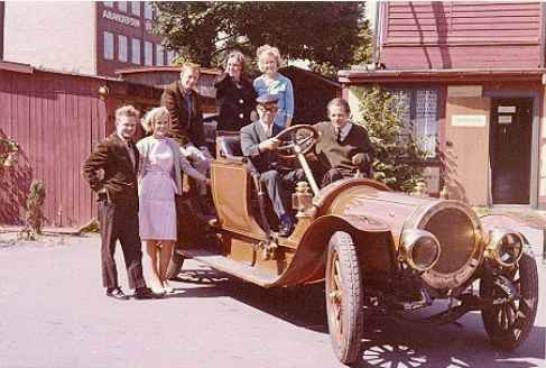 Standing beside the car, which had been used in the filming of the movie "The dear family" (1962), are Harry Rasmussen and Anne Lise Andersen. - The photo is taken by Henning Bahs with Kimball’s camera. After Ward and Betty Kimball had been shown around the Nordic Animated Cartoon Film studios, he concluded: "Your Studio looks exactly like all other animated cartoon studios in the World! One feels at home! " Then it was time for Ward and Betty to make a visit over at Nordisk Film Junior, where they greeted Ove Sevel, which incidentally years ago had been responsible for the dubbing of some of Disney's long cartoons, such as. "Cinderella" (1950; “Askepot”) and "Alice in Wonderland" (1951; “Alice I Eventyrland”). On one of the walls of the long corridor that led from the entrance of the building and to Sevel’s office at the end of the corridor, hung the movie posters for including some of Disney's long cartoons, among them also just "Cinderella". Mice Tim and Bom and the cat Lucifer listened to some of my favorite characters in the movie, and when we passed the poster, I ventured to ask a question to Kimball, and when the American custom was on first name terms with each other, I said, "Ward! Did you animate the mice and the Cat? "- There was a long pause, during which Kimball looked intently at me through his thick glasses, before he replied as follows:" You see, Harry, I have forgotten all about that movie! " Later on I wondered how it could be that Kimball had forgotten or maybe did not want to talk about exactly his work on "Cinderella" when he, according to my former information, had been an animator on the above mentioned characters, and not least the cat Lucifer, thus creating some of the best and most legendary animation at Disney’s. Only in the early 1980s, I found out that one of the reasons that 'memory failed' Kimball might be that there actually were several excellent animators who had worked on the mouse sequences, namely, to the subsequent eponymous character film director Woolie Reithermann which then had been supervising animator. At dinnertime Ward and Betty were of course invited to lunch in the cafeteria, wherin had been reserved table for 6 people. Apart from Kimball and his wife attended Ib and Kirsten, and Lehmann and I in the celebrated moment. Since Kirsten was one of us who spoke the best English, she was mainly leading the conversation, sometimes supplemented by Lehmann, who was also reasonably good at speaking English, but usually was not a man of many words. Ib also spoke English, but he remained to his customary beliefs largely silent during the entire lunch, as I did, mostly because I felt somewhat insecure about my English skills. Kirsten and Lehmann had high school diploma, while Ib 'only' had lower secondary education and I only school leaving examination from Second Free Medium. Unlike the others I had not learned English in school during the German occupation, but only German, which I was not very good at. 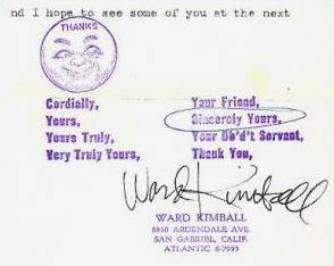 It happened, however, that I sometimes enjoyed the conversation around the lunch table and dared to make a comment or an inquisitive questions to the man, that Ward Kimball, whose name and work as an animator and character filmmaker I was fairly well acquainted with through the otherwise sparse literature on Disney employees that existed at the time. Over lunch, Ward and Betty told in their way that they had been in "the Tivoli garden" the day before, and both spoke most appreciative of the beautiful amusement park. "And imagine, the flowers are real!" They both said simultaneously. It was to their great disappointment, not the case with all vegetation in "Disneyland", the theme park in Anaheim, which was only about five years old and still in the building stage, when Disney in July 1959 visited Copenhagen and including Nordisk Film and Nordic Animated Cartoon Films. The park was opened to the public in 1955, ie 10 years before Ward and Betty Kimball's visit with us. The lunch we had on that occasion consisted of open sandwiches, as hostess Else Stæhr was master of. But the strange thing was that Kimball did not use a knife and fork, as we usually do, but picking the meat and ate it separately, while he actually left the bread alone. As probably well known the Americans do not so much use to eat open sandwiches and neither with knife and fork, but as the friendly and accommodating human, Betty Kimball was, she tried to follow the Danish custom and ate her sandwich with knife and fork, all the while she also got herself a good talk with Kirsten about – of course - everything else than cartoons. After lunch, Ward and Betty were invited to view a screening of Nordisk Animated Cartoon Films presentation reel, and the view was going on in the cinema up in Nordisk Film's central building. All of Nordic Animated Cartoon Films employees were also invited to the screening. However, it was not much, Ward came to see of the film reel containing various advertising cartoons and the two short films, Nordic Animated Cartoon Films had produced up to that time: "Thousands of G" (1962) and “He, She and Money" (1963), because about ten minutes after the light in the hall had been turned off, Ward nodded his head and fell asleep. Betty poked repeatedly to him, and he woke indeed up, but fell immediately asleep again. Film Screening lasted about an hour, and about five minutes before the lights again was lit in the hall, Kimball woke back up and remained so awake that he could see the rest of the presentation reel. Afterwards he excused himself by saying that he had not gotten much sleep in the last few days, but he had seen enough of the presentation of our films to be able to say: "I am really surprised, that your films are of such high quality!" We were of course some pieces, not least Ib Steinaa, who grew an inch or two after these appreciative words from a master. Mrs. Kimball and myself want to thank you and thank you again for showing us your studio when we visited Copenhagen. The lunch was great and so was the drink! We also enjoyed seeing your films and seeing the old Auto. Enclosed are enough prints for everyone appearing in the picture. (I hope). They took some funny pictures of me and the Copenhagen Fire Department the next day. These were supposed to appear in your local paper. Thanks again, and I hope to see some of you at the next Film Festival! 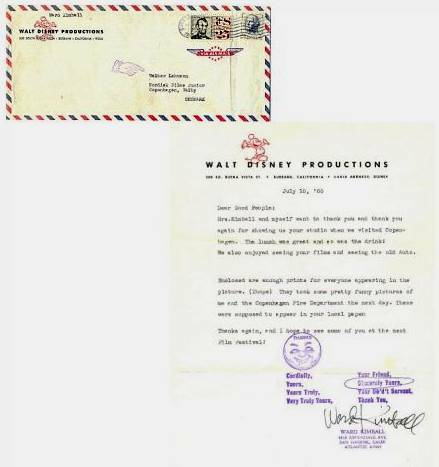 Above is the Christmas cards that staff at the Nordic Animated Cartoon Films jointly received from Ward Kimball up to Christmas 1965. Top upstage left shows the front cover of the folded card while the card is seen unfolded in its full length right. 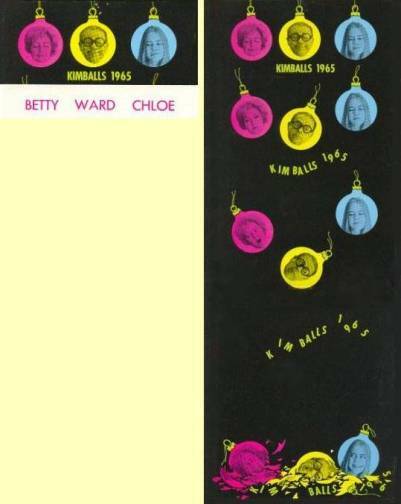 - Christmas © 1965 by Ward Kimball. After the interesting visit of one of Disney's famous Nine Old Men some of us felt it hard just to sit behind the lighting desk again to continue the work and the daily routine. Some of us dreamed all about making cartoons and just as good animation like the one we had for years been seen in Disney's short as well as long cartoons, but we also realized that we lacked both experience and practical possibilities - and perhaps talent - to develop and qualitatively improve our performance. There was simply not enough work, and not at all tasks, which there not were economics and time to practice on. Moreover, it never really got off the ground with some form of training of talents. Ib Steinaa had admittedly for a shorter time attempted a night school for students on study, but it was gradually slipped into the sand. For our other positions, which in the first instance would say Walther Lehmann, Flemming Jensen and me, we had each to do our own experience, both through the work-order tasks, and partly through self-study of the relatively few books on cartoons that existed at the time, and in particular to study Disney’s and UPA's cartoons. © 2014 by Harry Rasmussen. Above is the building on the site of Nordic Film's in Valby, where A / S Nordic Cartoon Films was housed from July 1957 to the end of 1966. 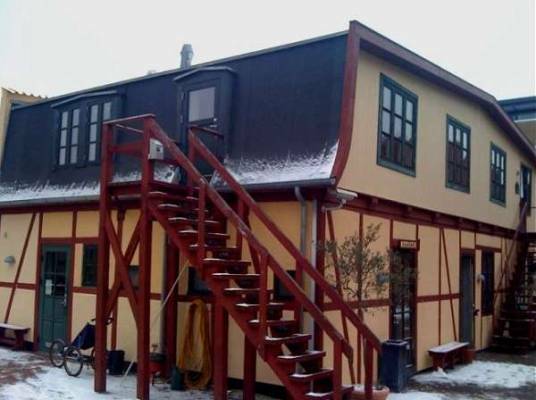 The company had occupied the entire first floor, to which two wooden stairs lead up. The staircase, which is seen in the foreground, leading to a door into the drawing offices, was in daily use by staff while stairs as glimpsed in the background on the right, leading up to the office, where production leader Kirsten Steinaa resided. Behind the window to the left of the picture was first a drawing room for the designers Mogens Gylling and Ib Clausen, but after the two had left the company, the space functioned as the inking and colouring department, which Anna Lise Andersen was the leader of. The first window in the facade just around the corner was the studio of the apprentices Anton Fredsøe, Antti Peränne and Kate Thygesen, from April 1,1959 for Anton Fredsøe, Antti Peränne and animator Harry Rasmussen. The next window in the series gave daylight to the designer Helge Christiansen and later to apprentice Elisabeth Halgreen, and even later to animator Flemming Jensen. Behind the third window in the series was first inking and colouring department, but from about 1962 it was the drawing office for animators Walter Lehmann, Flemming Jensen and apprentice Jacob Koch. The photo is taken on a snowy winter day in January 2010. - © 2010 by Hans Perk and The History of Danish Cartoons.